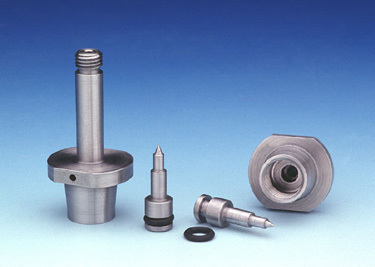 The Internal Bleed System improves fork damping by keeping the oil free of air. 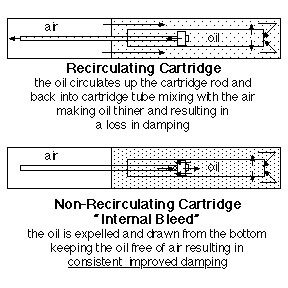 This is a non-recirculating cartridge system in which oil is expelled and drawn from the bottom of the cartridge. Stock systems circulate oil up the cartridge rod and back into the cartridge tube where it mixes with air and thins out, resulting in oil (and performance) fade after a few minutes of riding. The Internal Bleed System is CNC machined and fits 46 and 43 mm Kayaba upside down motocross forks. For bikes that already have an internal bleed system, Improved needle to further reduce the mixing of air and oil.